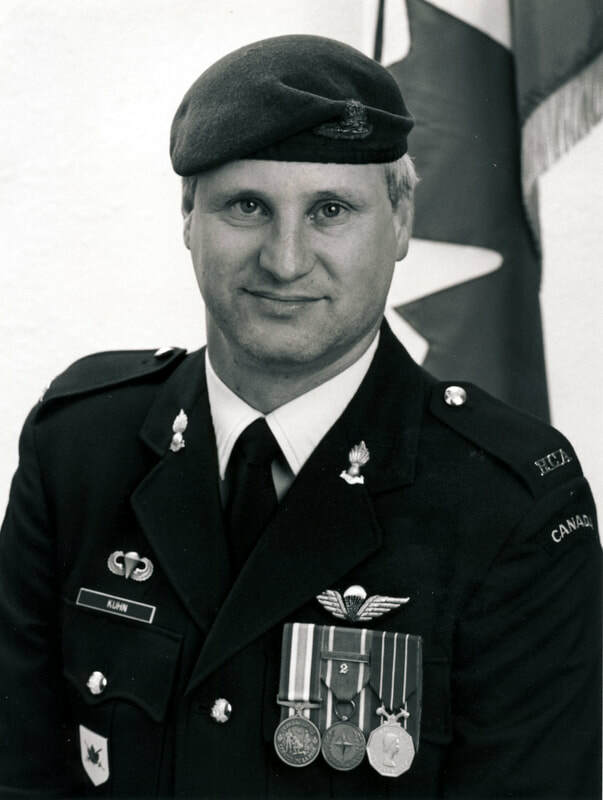 Taken on strength in the Regular Officer Training Plan 28 Jun 1989, entered Collège militaire royal de St. Jean Aug 1989, graduated as a Second Lieutenant May 1994, posted to 5e Régiment d'artillerie légère du Canada, promoted Lieutenant Aug 1996, deployed on OP STABLE with United Nations Support Mission in Haiti from Oct 1996 to Apr 1997, promoted Captain Jan 1998, deployed on OP RECUPERATION Winter 1998, completed Forward Observation Officer course Mar 1999, completed Forward Air Controller course in Sep 1999, deployed on OP PALADIUM ROTO 7 from Sep 2000 to Apr 2001 with B Battery 1st Regiment Royal Canadian Horse Artillery, posted to 5th (BC) Field Artillery Regiment RCA as Operations Officer/Adjutant Jul 2001, posted to 15th Field Artillery Regiment RCA as Adjutant Jul 2005, graduated from the Canadian Land Force Command and Staff College Sep 2005, posted to 5 Canadian Mechanized Brigade Group Headquarters Aug 2008, component transferred to 15th Field Artillery Regiment RCA Sept 2009, attended Fire and Effects course Jul 2012, qualified Reserve Battery Commander course Jul 2014, qualified Joint Reserve Command Staff Programme, appointed Battery Commander 31 Battery Jan 2011, promoted Major Nov 2012, appointed Second in Command May 2014, promoted Lieutenant-Colonel and appointed Commanding Officer 15th Field Artillery Regiment RCA 13 May 2017. 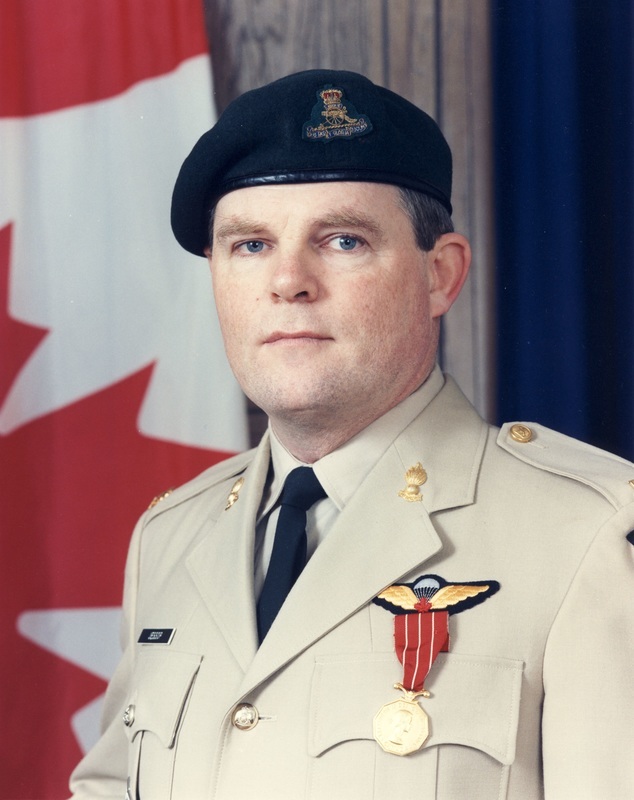 Taken on strength in the Regular Officer Training Program 1989, Second Lieutenant from 1991 to 1992, Lieutenant from 1992 to 1994, 3rd Regiment Royal Canadian Horse Artillery, Operational tour with UNFICYP-1992/1993, 1st Regiment Royal Canadian Horse Artillery, Captain from 1994, posted to 5th (BC) Field Artillery Regiment RCA, released Jun 1996, taken on strength 15th Field Artillery Regiment RCA on 6 Sep 2000, Captain from 2000 to 2004, Operational tour Operation ATHENA in Afghanistan in Jul 2004, Major from 2005 to 2014, promoted Lieutenant-Colonel and appointed Commanding Officer in 2014, handed over command on 13 May 2017. 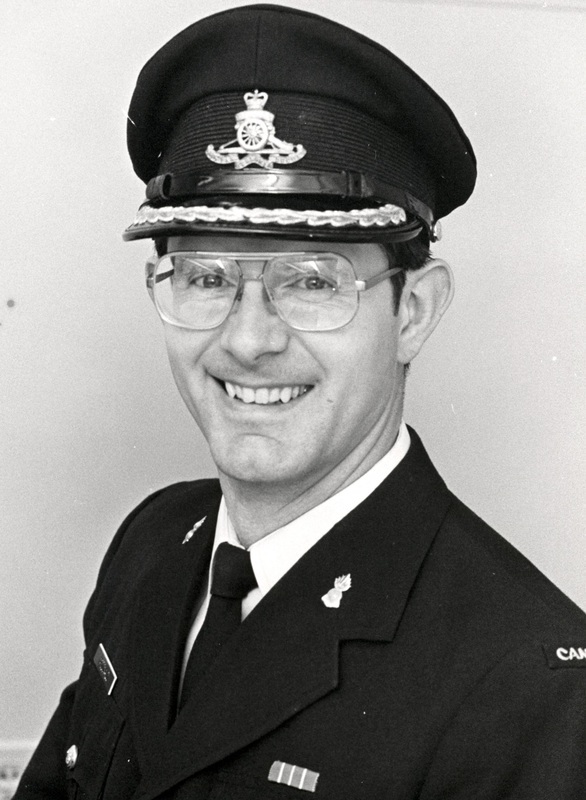 ​Taken on strength as a Gunner in 15th Field Artillery Regiment RCA on 25 Mar 1982, qualified General Military Training on 11 Aug 1982, qualified TQ1 Artilleryman on 14 Oct 1982, promoted Bombardier on 25 Mar 1983, qualified Artillery Communicator on 8 Apr 1983, qualified Junior Non-Commissioned Officer on 29 Jun 1984, appointed Officer Cadet on 23 Mar 1985, promoted Lieutenant on 7 Aug 1986, qualified Junior Officer Staff Course on 14 Jan 1987, Operational tour with UNFICYP-1992/1993, promoted Captain on 10 Aug 1993, Major from 2005 to 2011, promoted Lieutenant-Colonel and appointed Commanding Officer from 2011 to 2014, transferred to 39 Canadian Brigade Headquarters in 2014, appointed Commanding Officer 39 Signals Regiment in 2017. 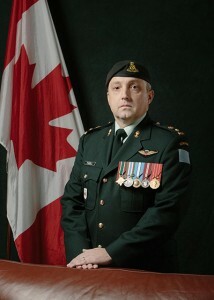 Taken on strength as a Private in The British Columbia Regiment (Duke of Connaught’s Own) in 1982, commissioned later that year as a Second Lieutenant, Major from 1996 to 2007, transferred in 2005, appointed Commanding Officer 15th Field Artillery Regiment RCA from 2007 to 2011, Lieutenant-Colonel from 2008 to 2011. 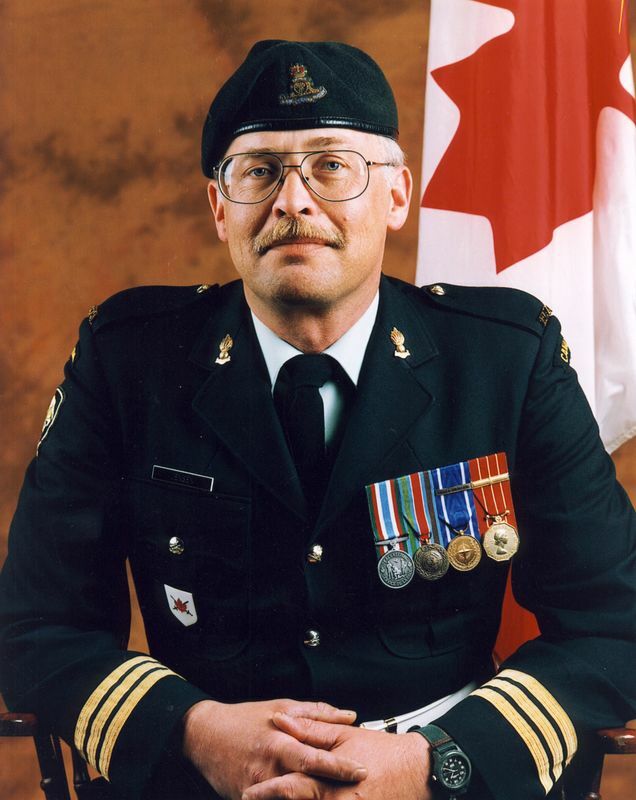 Transferred to BC Militia District Headquarters from 49th Field Artillery Regiment RCA, Transferred to 15th Field Artillery Regiment RCA, Second in Command 2001 to 2004, Lieutenant-Colonel and Commanding Officer from 2004 to 2007, Deputy Commander 39 Canadian Brigade Group from 2008. 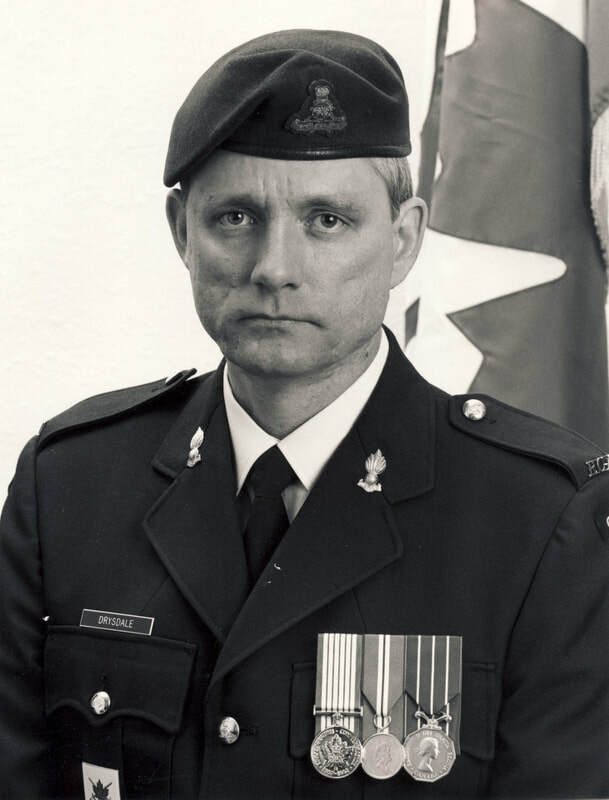 Taken on strength 1981 as Officer Cadet, Lieutenant from 1984 to 1985, Captain from 1985 to 1992, served in Les Fusiliers de Sherbrooke, Le Regiment de Hull, 30th Field Regiment, RCA and 20th Field Regiment RCA, Major from 1992 to 2001, instructed on the Combat Team Commander’s course on two occasions and in 1991 was granted the qualification, accompanied the Egyptian Army during the liberation of Kuwait as an observer in 1991, Lieutenant-Colonel from 2001, appointed Commanding Officer 15th Field Artillery Regiment RCA in 2001, Regional Liaison Officer from 2010 to 2015, completed a BA at Bishop's University, an MBA at INSEAD, and a PHD at City University - London, employed as a Professor of Business Management at Kwantlen University College, consultant in the area of corporate finance, has served as a municipal councillor in the Township of Langley, Conservative candidate in 2015 federal election. 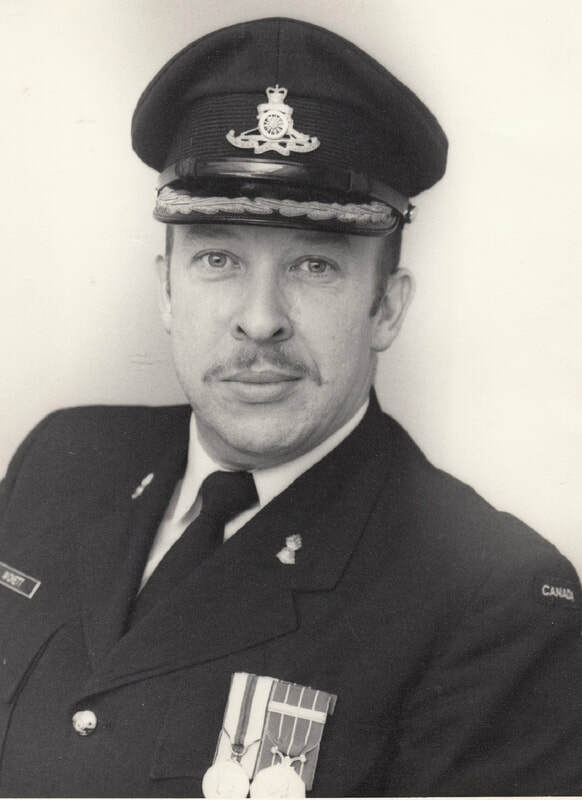 Taken on strength Regular Force, Lieutenant with W Battery 2nd Regiment Royal Canadian Horse Artillery in Cyprus in 1965, 4th Regiment Royal Canadian Horse Artillery 1966, Royal Canadian School of Artillery in 1967, Captain 1st Regiment Royal Canadian Horse Artillery from 1968 to 1970, 1 Airborne Battery from 1971 to 1972, CAS as at 31 Dec 1973 to 31 Dec 1975, 1 Airborne Battery as at 31 Dec 1976, 2nd Regiment Royal Canadian Horse Artillery as at 31 Dec 1977 to 31 Dec 1978, Special Service Force Headquarters and Signals Squadron as at 31 Dec 1979 to 31 Dec 1981, Canadian Airborne Regiment as at 31 Dec 1982, Canadian Airborne Centre Edmonton as at 31 Dec 1983 to 31 Dec 1986, Regular Support Staff Officer 5th (BC) Field Battery Royal Canadian Artillery Dec 1987, Major Combat Training Centre Gagetown as at Dec 1988 to Dec 1989, Canadian Forces Officer Candidate School as at Dec 1990 to Feb 1993, operational tour with UNPROFOR as at Feb 1994, Esquimalt as at Feb 1995, transferred to Supplementary Holding Reserve, transferred to 15th Field Artillery Regiment RCA on 2 Mar 1996, promoted Lieutenant-Colonel and appointed Commanding Officer 15th Field Artillery Regiment RCA on 20 Apr 1996. 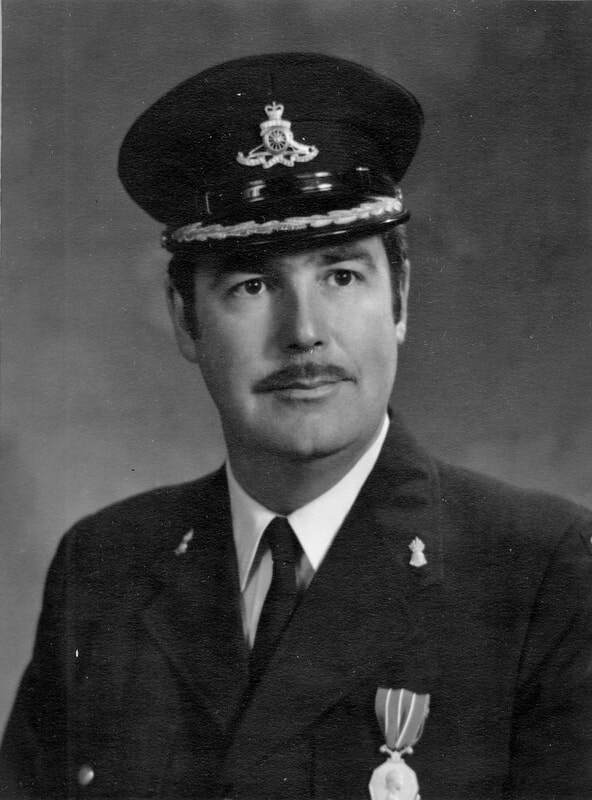 Taken on strength Royal Artillery on 9 February 1958, 3rd Regiment Royal Horse Artillery in 1960 , promoted Warrant Officer Class I and appointed Regimental Sergeant Major of 19th Field Regiment Royal Artillery in 1974, Royal School of Artillery Garrison Sergeant Major in 1976, taken on strength 15th Field Artillery Regiment in 1981 as Master Warrant Officer, transferred to 56th Field Artillery Regiment, commissioned as Captain, returned to 15th Field Artillery Regiment, Major from 1990 to 1991, promoted Lieutenant-Colonel and appointed Commanding Officer 15th Field Artillery Regiment RCA from 1991 to 1996, Honorary Colonel from 2004 to 2010. 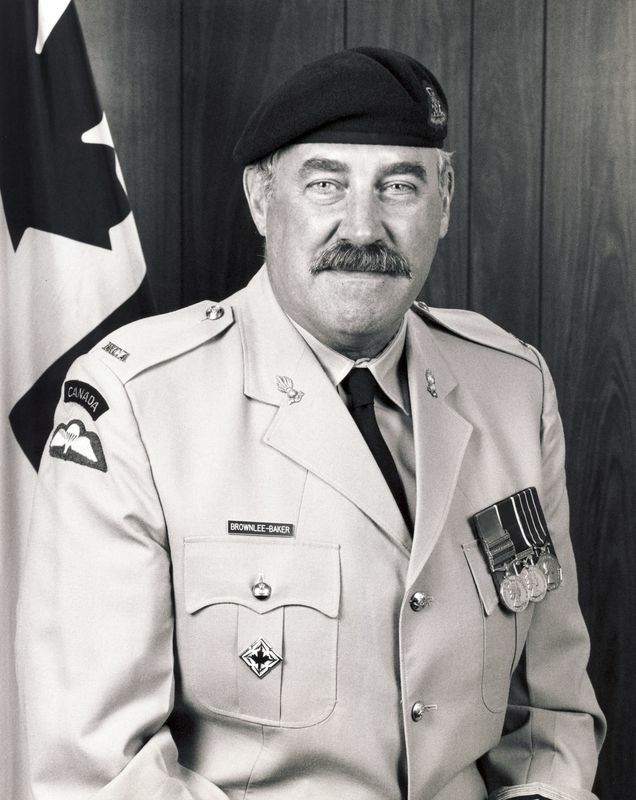 Taken on strength in 15th Field Artillery Regiment RCA with previous Service from 21 Jun 1961 to 21 Jun 1964, completed Second Lieutenant Block 1 on 18 Jul 1975, completed Second Lieutenant Block 2 on 8 Aug 1975, qualified Basic Parachutist on 30 Jan 1976, promoted Lieutenant on 1 Sep 1976, completed Captain qualiying Course on 15 Jul 1977, completed Tactics Block 10 course on 27 Jul 1979, completed Artillery Captain Block 9 course on 10 Aug 1979, promoted Captain on 1 Sep 1979, qualified MITCP Basic Officer Training Block 3 on 1 Sep 1982, qualified Artillery Major Block 12 course on 16 Jul 1983, promoted Major on 19 Jan 1985, qualified MITCP Block 11 on 15 Jul 1982, qualified MITCP Block 13 on 18 Apr 1986, completed Militia Command and Staff Course Block 14 on 26 Jul 1986, promoted Lieutenant-Colonel and appointed Commanding Officer on 10 Sep 1988, transferred to Supplementary Ready Reserve on 7 Mar 1992. 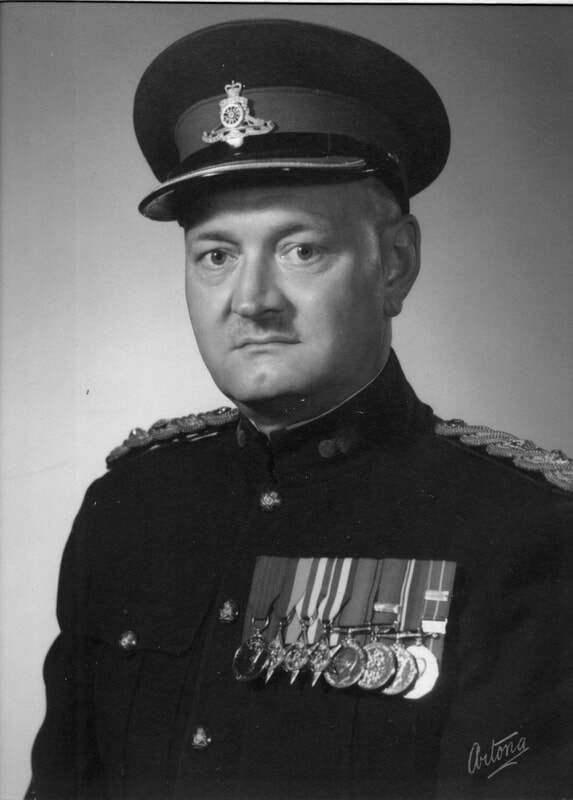 Taken on strength as an Officer Cadet in 2nd Field Artillery Regiment RCA on 26 Apr 1971, completed Lieutenant Qualifying course on 27 Aug 1971, promoted Second Lieutenant on 1 Sep 1971, completed Captain Qualifying Course Part I on 24 Mar 1974, completed Basic Parachutist Course on 25 Nov 1974, completed Captain Qualifying Part II Course on 12 Aug 1975, promoted Captain on 1 Jan 1976, completed Major Qualifying Course on 21 Jul 1977, transferred to 15th Field Artillery Regiment RCA on 11 Sep 1977, promoted Major on 1 Sep 1979, completed Militia Command and Staff Course on 24 Jul 1982, promoted Lieutenant-Colonel and appointed Commanding Officer on 1 Aug 1985, transferred to Headquarters Pacific Militia Area on 11 Sep 1988. 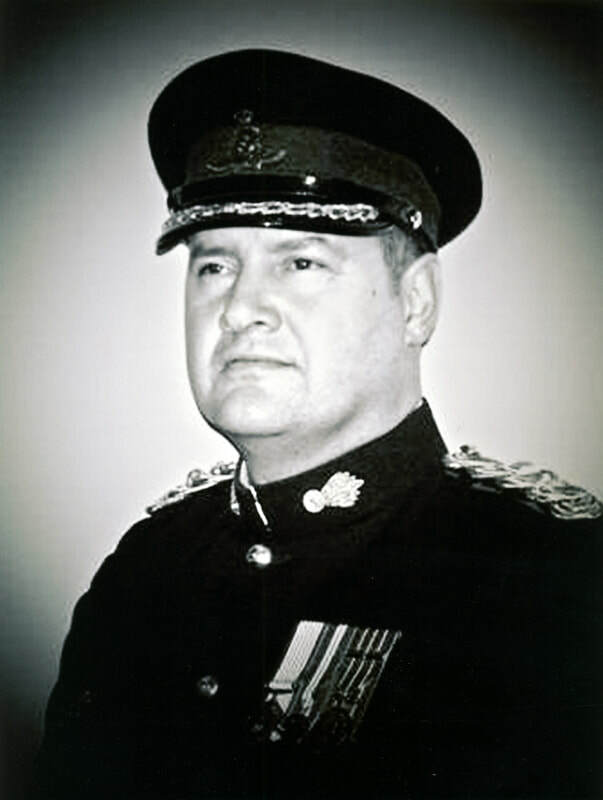 ​Taken on strength 15th Field Regiment RCA on 21 Jun 1956, struck off strength on transfer to Western Command Contingent COTC as Officer Cadet on 30 Jul 1956, taken on strength on transfer Western Command Contingent COTC on 1 Sep 1957, promoted Second Lieutenant on 1 Sep 1957, promoted Lieutenant on 8 Sep 1959, promoted Captain on 1 Dec 1962, promoted Major on 1 Feb 1969, transferred to Supplementary list on 15 Jun 1979, Attached from Supplementary List on 21 Aug 1980, promoted Lieutenant-Colonel and Commanding Officer 18 Dec 1983, released 31 Jul 1985, deceased 26 Feb 2005. 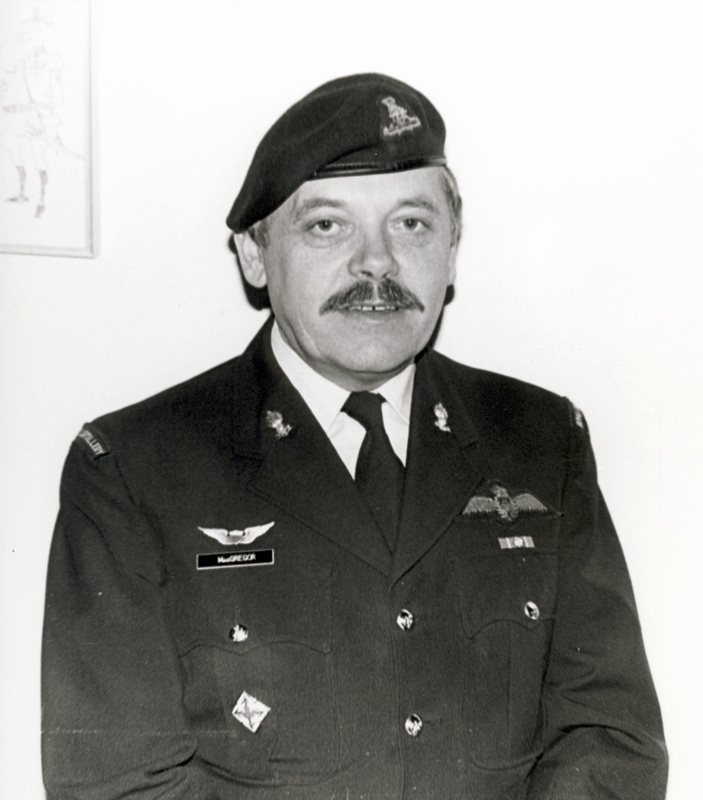 Captain 3rd Regiment Royal Canadian Horse Artillery as at 1 Nov 1965, 2nd Regiment Royal Canadian Horse Artillery Air OP Troop as at 1 Nov 1966 to Jan 1967, 1st Regiment Royal Canadian Horse Artillery Air OP Troop as at Jan 1967 to 1969, 403 Squadron as at 1970, taken on strength in 15th Field Artillery Regiment RCA as a Major from Supplementary List 9 Feb 1980, promoted Lieutenant-Colonel and appointed Commanding Officer 15th Field Artillery Regiment RCA 1 Nov 1981, transferred to Supplementary List 18 Dec 1983. 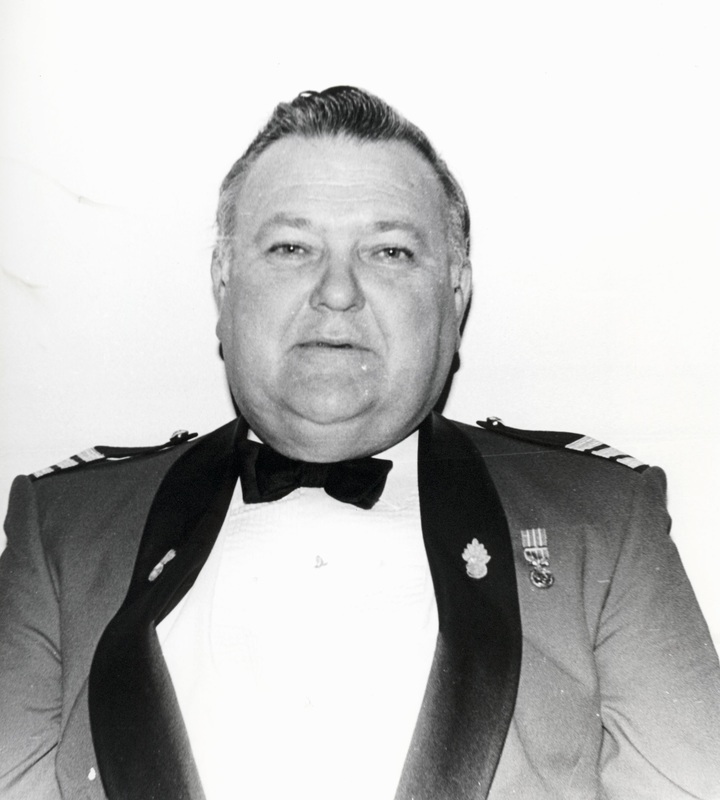 Taken on strength with the Militia in 1959, Signalman in 3 Signals Regiment, Officer Cadet in Canadian Officers Training Corps 1963 to 1964, Commissioned in 1964 serving as a Lieutenant with 5th (BC) Field Battery RCA, transferred from 5(BC)Field Battery RCA in 1967, Captain in 1969, Major from 1973 to 1976, Lieutenant-Colonel from 1978 to 1982, Commanding Officer 15th Field Artillery Regiment RCA from 1978 to 1981, Colonel from 1987 to 1990, President of Royal Canadian Artillery Association from 1987 to 1988, Brigadier General from 1990 to 1994, Major-General from 1997 to 2000. 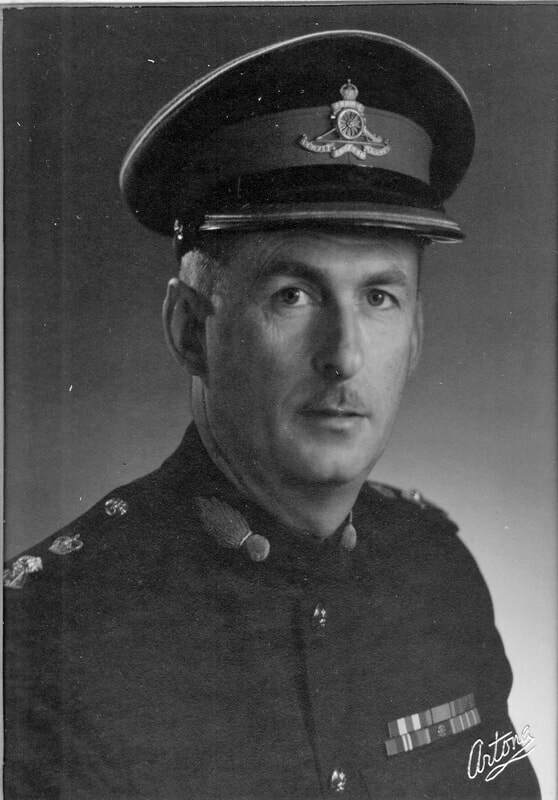 Taken on strength 43 Medium Anti-Aircraft Regiment RCA 16 Feb 1953, promoted Bombardier 1954, promoted Sergeant 1957, transferred to 15th Field Regiment RCA 1959, commissioned as Second Lieutenant 16 Nov 1960, promoted Lieutenant 1962, promoted Captain 1966, promoted Major 1 Oct 1969, promoted Lieutenant-Colonel and appointed Commanding Officer 15th Field Artillery Regiment Royal Canadian Artillery 19 Oct 1973, promoted Colonel, promoted Brigadier-General and appointed Area Commander Pacific Militia Area, appointed aide de camp to Governor-General 1978 to 1979, President of Royal Canadian Artillery Association 1979 to 1980, retires as Area Commander in 1981, appointed Honorary Lieutenant-Colonel 1992, appointed Honorary Colonel 1995. 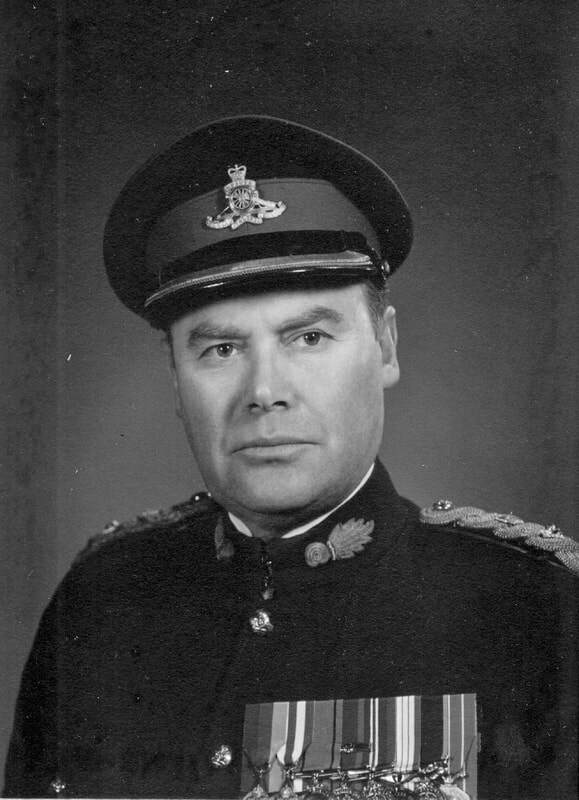 Taken on strength as a Gunner with 13th Field Battery 26 Field Regiment RCA in 1952, transferred to Banff Battery of 19th Medium Regiment RCA from 1955 to 1956, promoted Sergeant, attended 6 month Officer Cadet Programme Command Contingent Method B at Camp Shilo MB in 1956/57, returned to 19th Medium Regiment RCA in Calgary in 1957/58, transferred to 15th Field Artillery Regiment RCA as a Lieutenant from 1959 to 1961, promoted Major in May 1968, appointed Battery Commander of 158 Battery which was renamed 68 Battery, promoted Lieutenant-Colonel and appointed Commanding Officer from 1972 to 1973, retired as instructor at British Columbia Institute of Technology, School of Business in 2000 (Master Teaching Award year 2000). 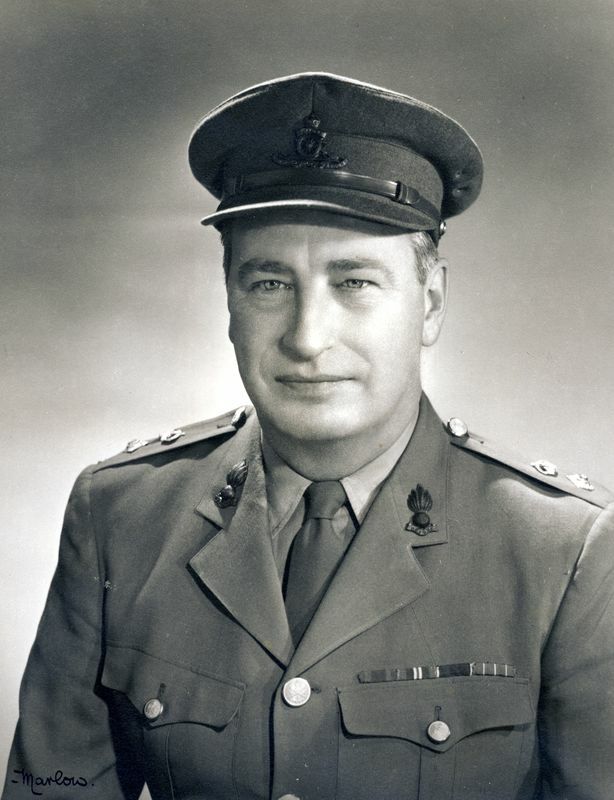 Taken on strength with 15th Field Regiment RCA on 11 Mar 1948, appointed Lance Bombardier on 16 Sep 1948, appointed Bombardier on 1 Jun 1950, appointed Acting Sergeant on 14 Jun 1951, Officer Cadet on 29 Sep 1951, to be Second Lieutenant on 28 Jun 1952, promoted Lieutenant on 7 Sep 1955, awarded Canadian Forces Decoration 30 May 1960, Captain in 1962, Adjutant in 1962, Major in 1965, Battery Commander 158 Battery in 1965, Lieutenant-Colonel and Commanding Officer from 1969 to 1972, deceased 28 Jun 1994, buried Victory Memorial Park Surrey BC. 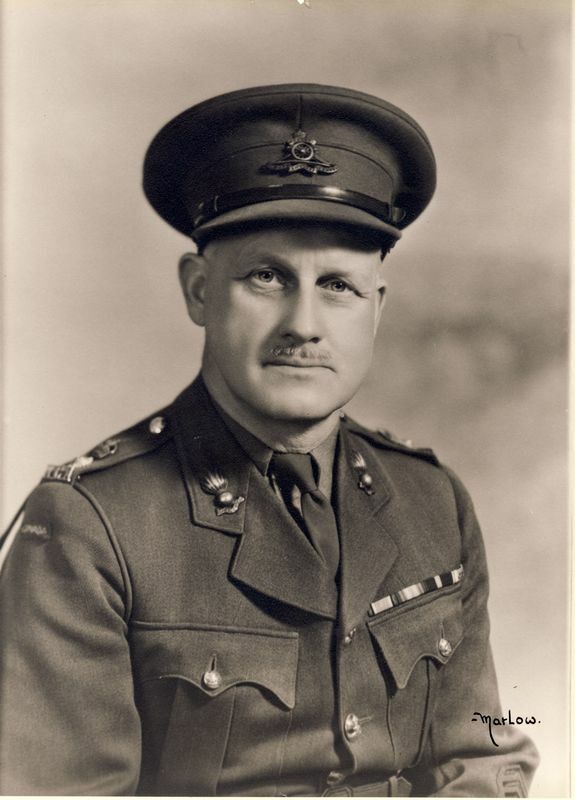 Taken on strength from the General List on 1 Apr 1946 as a Lieutenant in 15 Coast Regiment RCA, promoted Captain on 3 Nov 1947 to 1948, to be Major from 3 Jul 1951, appointed Battery Commander 31 Battery on 1 Sep 1957, promoted Lieutenant-Colonel and appointed Commanding Officer 1965, promoted Colonel 1969, appointed Honorary Staff Sergeant in Warrant Officers and Sergeants' Mess, deceased 17 March 2004. 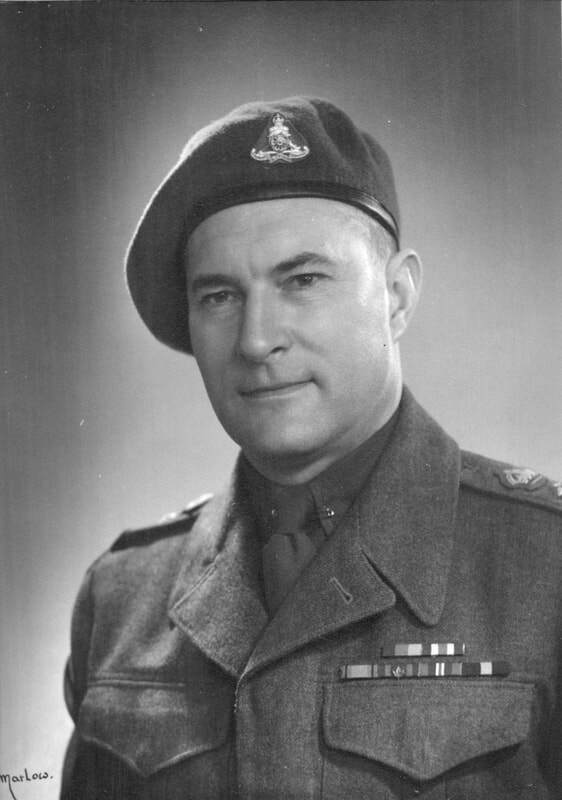 Lieutenant with 2nd Canadian Field Regiment RCA in 1945, awarded George Medal 6 Oct 1945, Major in 1952, 43rd Medium Anti-Aircraft Regiment RCA from 1958 to 1959, Second in Command in 1959, awarded Canadian Forces Decoration 6 Oct 1952, promoted Lieutenant-Colonel and appointed Commanding Officer from 1962 to 1965, Vice-President of Royal Canadian Artillery Association in 1967, President Royal Canadian Artillery Association in 1968, deceased 26 Oct 1989. 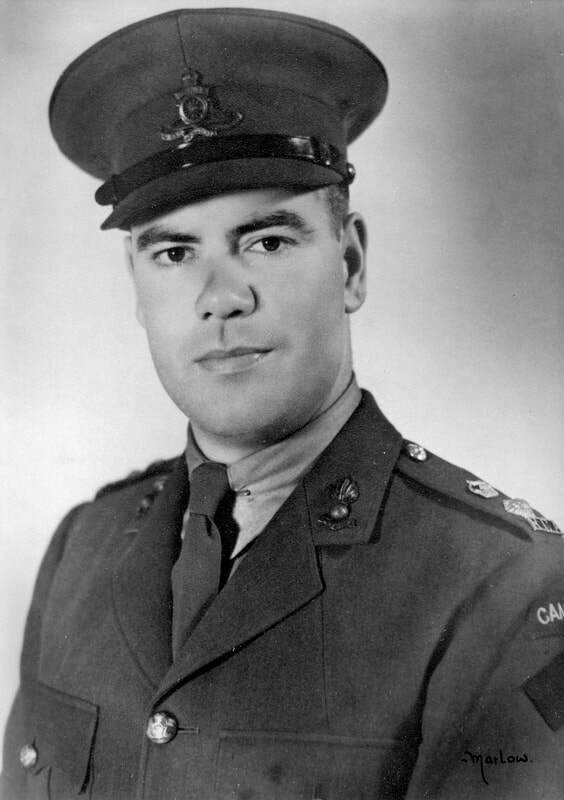 Lance Bombardier (Acting Bombardier) in 85 Heavy Battery 15th (Vancouver) Coast Brigade RCA on 26 Aug 1939, Lieutenant in 1941, taken on strength from the retired list to 85 Battery 15th Coast Regiment RCA on 1 Apr 1946, promoted Captain on 10 Apr 1947, to be Major on 27 May 1951, struck off strength on transfer to Supplementary Reserve (RCA) on 2 Sep 1957, attached fap from Supplementary Reserve (RCA) on 3 Sep 1957, ceases attachment on 15 Nov 1957, taken on strength on transfer from 24 Militia Group Headquarters on 1 Oct 1958, promoted Acting Lieutenant-Colonel on 1 Oct 1958, appointed Commanding Officer on 1 Oct 1958, awarded Canadian Forces Decoration 14 Nov 1960. Taken on strength 15th Brigade Canadian Artillery as a Gunner 1929, taken on strength 15th (Vancouver) Coast Brigade RCA NPAM as a Gunner 31 Jul 1940, enroled 15th (Vancouver) Coast Regiment RCA (Reserve) 8 Mar 1941, assigned regimental number V9905, to be Acting Sergeant 1 Sep 1940, , assigned new regimental number K416504, Second Lieutenant 1941, posted Canadian Intelligence Corps, wounded by V-1 flying bomb, recovered in England, returned to Holland with Counter-Intelligence, Major 1951, awarded Canadian Forces Decoration 15 Jan 1951, promoted Lieutenant-Colonel and Commanding Officer 43rd Medium Anti-Aircraft Regiment RCA from 1955 to 1959, awarded 1st clasp to Canadian Forces Decoration 5 Nov 1956, appointed Honorary Lieutenant-Colonel 15th Field Artillery Regiment RCA 1 Apr 1970, appointed Honorary Colonel 10 May 1972, stood down 9 May 1980, deceased 7 Jun 1999. Taken on strength British Columbia Hussars Aug 1939, joined Canadian Active Service Force 10 Sep 1939, assigned 3 Searchlight Battery 1 Searchlight Regt RCA, served at Narrows North as Lance Bombardier, assigned as Drill Instructor at Seaforth Armoury, promoted Sergeant, graduated Officers Training Course 6 Sep 1941, posted Halifax for course on Heavy Coast Artillery, recalled to 3rd Searchlight Battery in Vancouver Dec 1941, assigned to Albert Head for Light Anti-Aircraft and Heavy Anti-Aircraft courses, posted 28th Anti-Aircraft Regiment with Batteries at Boundary Bay and Sea Island Airports, posted to Camp Shilo MB for courses on 25 pounder, wheeled and self-propelled, assigned to Land Service Mattress Cadre (LSM) for development of Rocket Artillery at Seaford England, landed Gold Beach Aug 1944, assigned 112 Cdn LAA Battery to re-role as 1st Canadian Rocket Battery RCA, appointed Command Post Officer from first action in 1944 at Breskins Holland through to cease fire Germany on 5 May 1945, T/Captain and Adjutant of 15 Coast Regiment RCA in 1946, appointed provisional Major 5 Feb 49 and OC 158 Battery, to be Major 7 May 1950, transferred to 24 Militia Group Headquarters 31 Oct 1954, transferred to 15th Field Regiment RCA 23 Sep 1955, promoted Acting Lieutenant Colonel and appointed Commanding Officer 23 Dec 1955, promoted Lieutenant-Colonel 23 Dec 1957, relinquished appointment of Commanding Officer 1 Oct 1958, struck off strength on transfer to 24 Militia Group Headquarters 1 Oct 1958, assigned to Pacific Command Headquarters as DAQMG, retired in 1959, appointed Honorary Lieutenant-Colonel from 1967 to 1970, elected President of The Royal Canadian Artillery Association, President and Owner of Adanac Customs House Brokers Ltd, Past President University Club of Vancouver, Past President Kiwanis Club of Vancouver, Past President B.C. 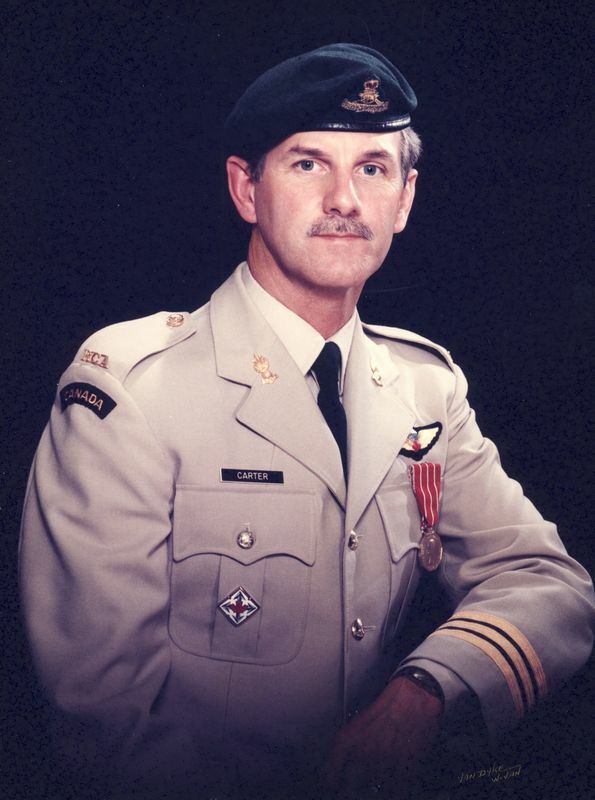 Customs House Brokers Association, Former Chairman West Vancouver Parks and Recreation Commission, deceased 22 January 2019. 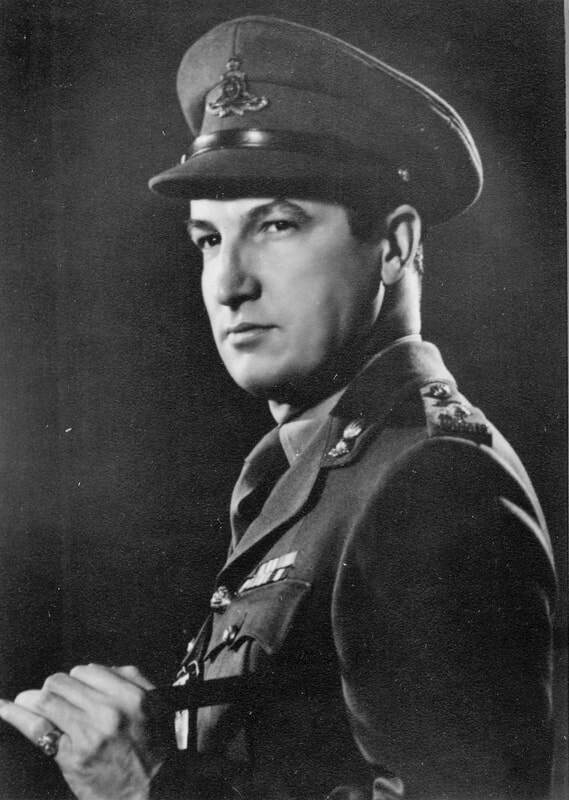 Second Lieutenant in 31st Heavy Battery 15th (Vancouver) Coast Brigade RCA CASF in 1939, Lieutenant in 1940, Captain in 1941, 85th Battery 15th (Vancouver) Coast Brigade RCA NPAM in 1941, appointed Battery Commander 31st Battery in May 1941, Lieutenant-Colonel and Commanding Officer of 43 Heavy Anti-Aircraft Regiment RCA from 1952 to 1955, awarded Canadian Forces Decoration 24 Mar 1952, appointed Honorary Lieutenant Colonel from 1962 to 1967, Chancellor of UBC from 1969 to 1972, appointed Honorary Colonel from 1967 to 1972, deceased 8 Dec 1982. 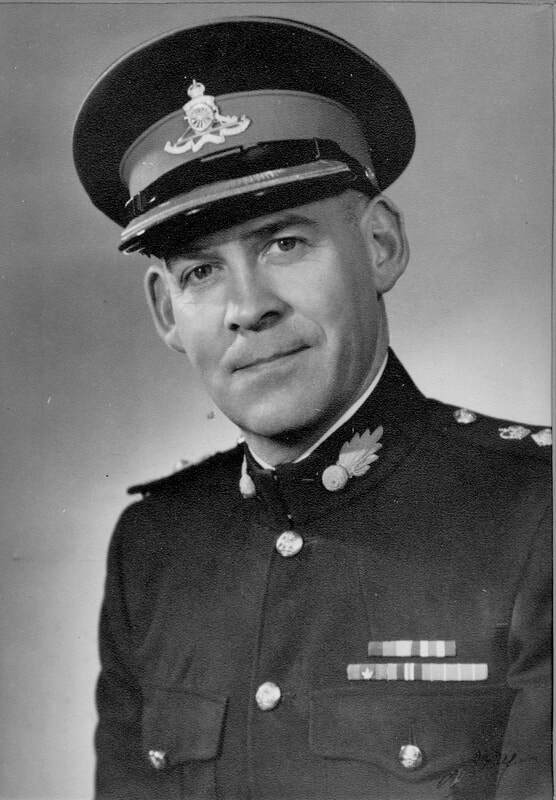 Lieutenant-Colonel from 1952 to 1954, Commanding Officer 102nd Coast Regiment RCA from 1952 to 1954, awarded Canadian Efficiency Decoration on 25 May 1953, deceased 22 May 1987, buried Holy Trinity Anglican Cemetery Sidney BC. 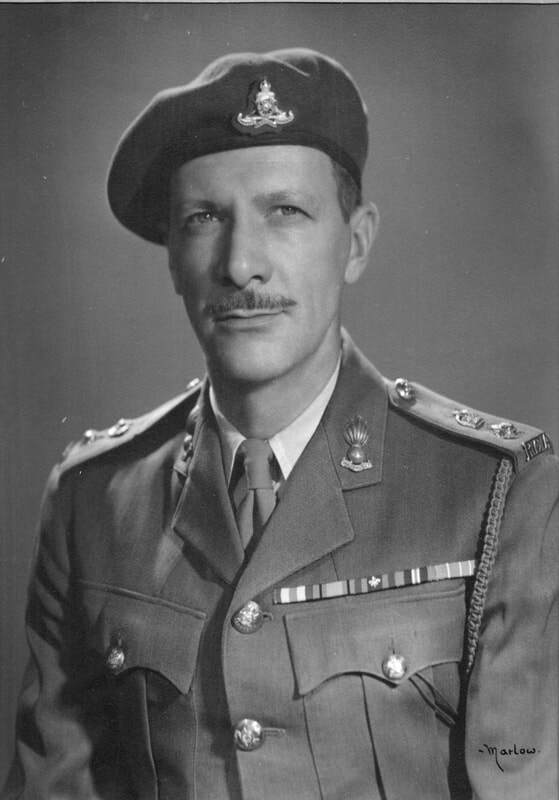 Lieutenant in 2 Medium Regiment RCA, Acting Captain in 1946, Mention in Despatches 9 Mar 1946, taken on strength from General List 15 Coast Regiment RCA 13 Aug 1946 as Lieutenant and Temporary Captain, promoted Major in 85 Battery 11 Apr 1947, appointed Second in Command 17 Oct 1948, promoted Lieutenant-Colonel and appointed Commanding Officer 7 Apr 1951, awarded Canadian Forces Decoration 17 Aug 1953, relinquished appointment of Commanding Officer 22 Dec 1955, struck off strength on transfer to Supplementary Reserve (RCA) 23 Dec 1955, deceased 21 Jul 1981, buried Ocean View Burial Park Burnaby BC. 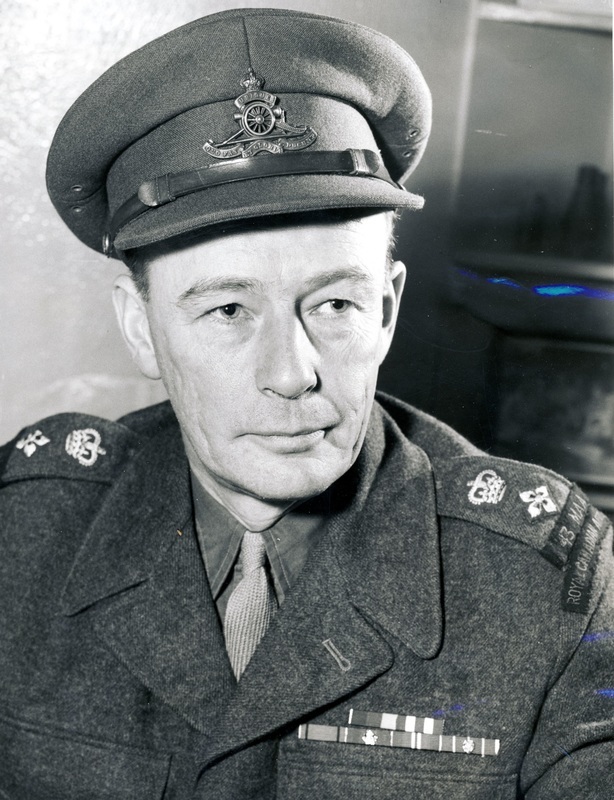 Lieutenant-Colonel 1944, departed for Australia for liaison and planning duties for the employment of Canadian soldiers on radar duties in support of Australian forces 15 Jun 1944, awarded Efficiency Decoration 1944, appointed Commanding Officer of 102 Coast Regiment RCA 1949 to 1952. 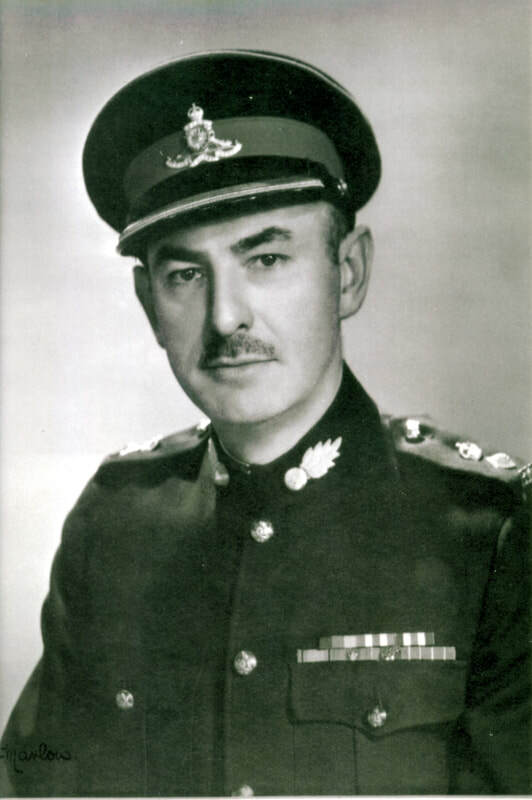 Major in 3rd Light Anti-Aircraft Regiment Royal Canadian Artillery on 1 Mar 1944, Lieutenant-Colonel from 1949 to 1951, Commanding Officer 43rd Heavy Anti-Aircraft Regiment RCA from 1949 to 1951, awarded Canadian Forces Decoration 15 Jan 1951, deceased 1 Sep 1979, buried Mountain View Cemetery Vancouver BC. 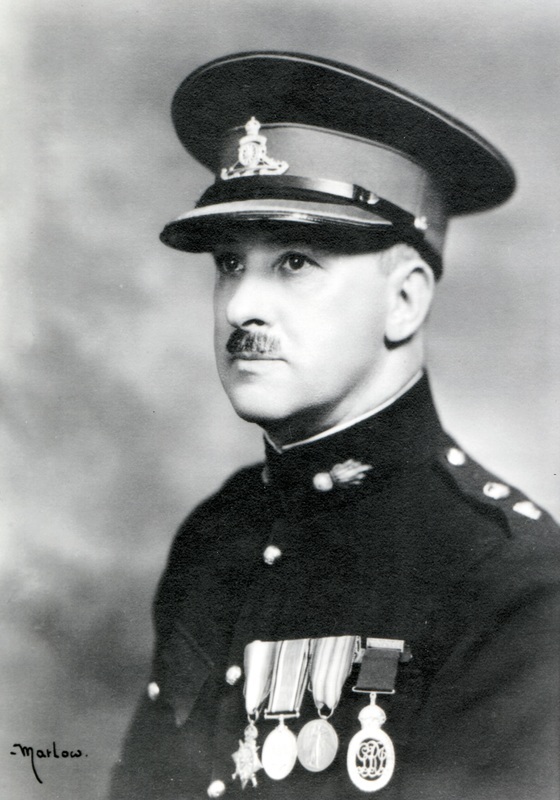 Taken on strength as a Trooper with British Columbia Light Horse 1929, subaltern with British Columbia Dragoons in Vernon, attached 111th Field Battery in Nelson, taken on strength 15th Field Brigade RCA in Vancouver 1937, Second Lieutenant in 58th Battery 15th (Vancouver) Coast Brigade RCA CASF in 1939, Captain from 1940 to 1941, transferred to 17th Field Regiment RCA 1941, promoted Major, set up and commanded Land Service Mattress Party (3 inch rockets) Sep 1944, Battery Commander 1st Rocket Battery Royal Canadian Artillery, posted to 19th Army Field Regiment Royal Canadian Artillery, returned to Canada Sep 1945, appointed Second in Command 15 Coast Regiment RCA on 1 Apr 1946, promoted Lieutenant-Colonel and appointed Commanding Officer from 15 Oct 1948 to 5 Apr 1951, struck off strength to Supplementary Reserve on 5 Apr 1951, Advisory Committee of Royal Canadian Artillery Association from 1965 to 1966, appointed Honorary Colonel 7th Toronto Regiment RCA 1967, deceased 1977, buried Mount Pleasant Cemetery Toronto ON. 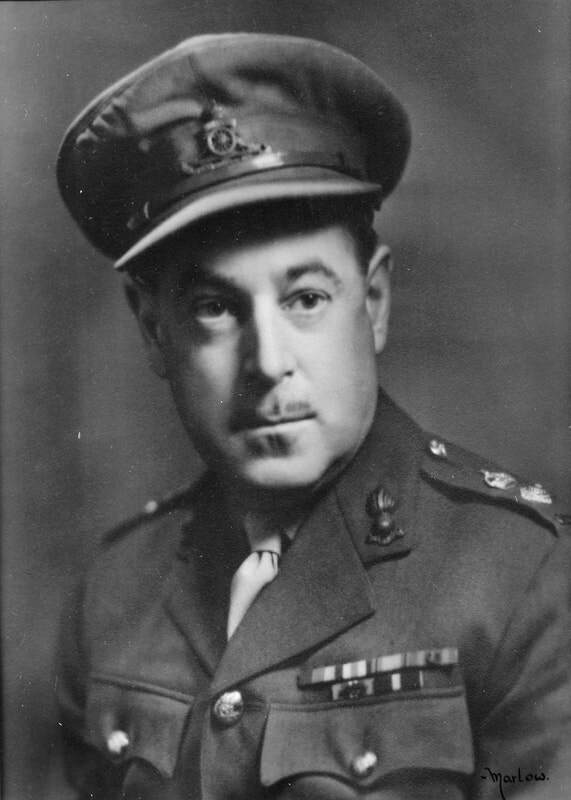 Lieutenant in 1934, Captain in 58th Heavy Battery in 1939, Major in 1940, Battery Commander Yorke Island from 7 Oct 1940 to 13 Feb 1941, reverted to Major for overseas service in 1943, taken on strength from Retired List and appointed Lieutenant-Colonel from 1 April 1946 to 1948; Commanding Officer 15th Coast Regiment RCA from Apr 1946 to 1948, Commanding Officer 15th Field Regiment RCA from 1948 to Oct 1948, taken on strength Headquarters 5 Artillery Group RCA Oct 1948, Acting Brigadier General in 1958, appointed Honorary Lieutenant-Colonel from 24 Oct 1983 to 23 Oct 1986, appointed Honorary Colonel from 24 Oct 1986 to 23 Oct 1988, deceased 8 May 1996. 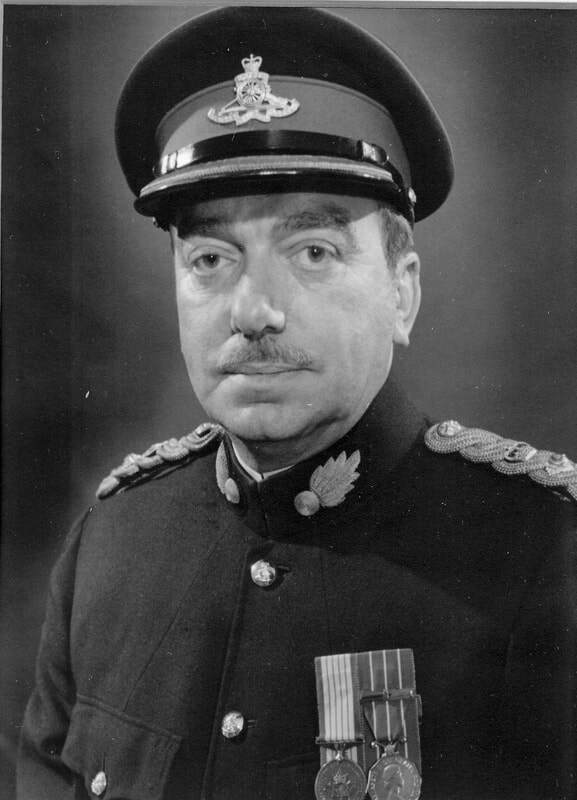 Royal Military College 1930 to 1932, Captain in 58th Heavy Battery 15th (Vancouver) Coast Brigade Royal Canadian Artillery in 1939, Lieutenant in 111th Battery in 1940, married Charlotte Louise Christmas 2 Mar 1940, Major 6th Field Regiment Royal Canadian Artillery 1 Mar 1944, Mentions in Despatches 6 Oct 1945, Lieutenant-Colonel and Commanding Officer 43rd Heavy Anti-Aircraft Regiment RCA from 1946 to 1949, deceased 22 May 1985. 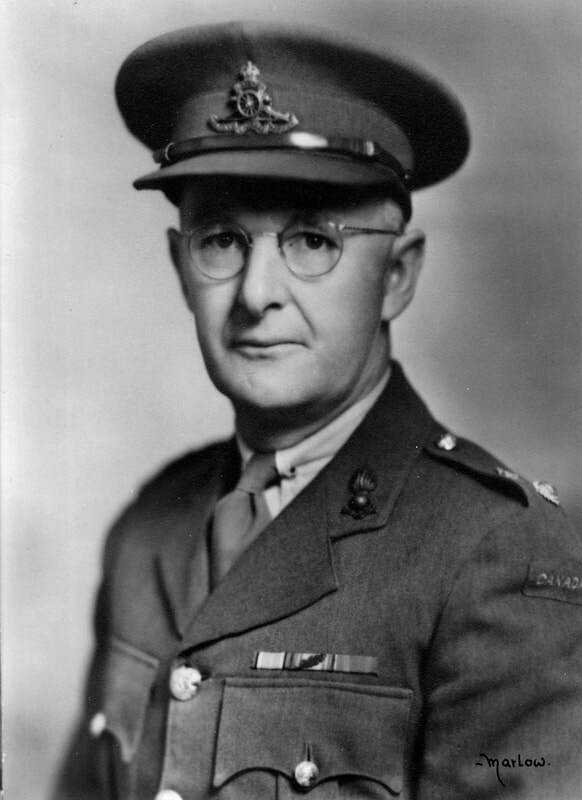 ​Lieutenant from 1917 to 1930, McGill University COTC 1914-16, 6th McGill Siege Battery Gunner May 1916, Corporal England Sept 1916, France 7th Siege Battery March 1917, 10th Siege Battery June 1917, Sergeant, 1st Canadian Heavy Battery Lieutenant Feb 1918, Canada and discharged May 1919, member of Vancouver Overseas Artillery Association, Major from 1937 to 1943, OC 58th Heavy Battery in 1939, O.C. 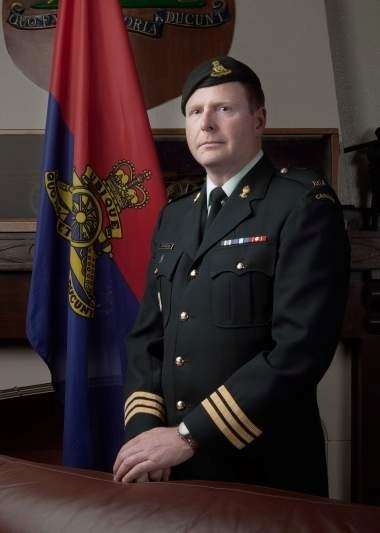 "X" Super-Heavy Battery, Lieutenant-Colonel and Commanding Officer 15th (Vancouver) Coast Regiment RCA, assumed command of 17 (North B.C.) 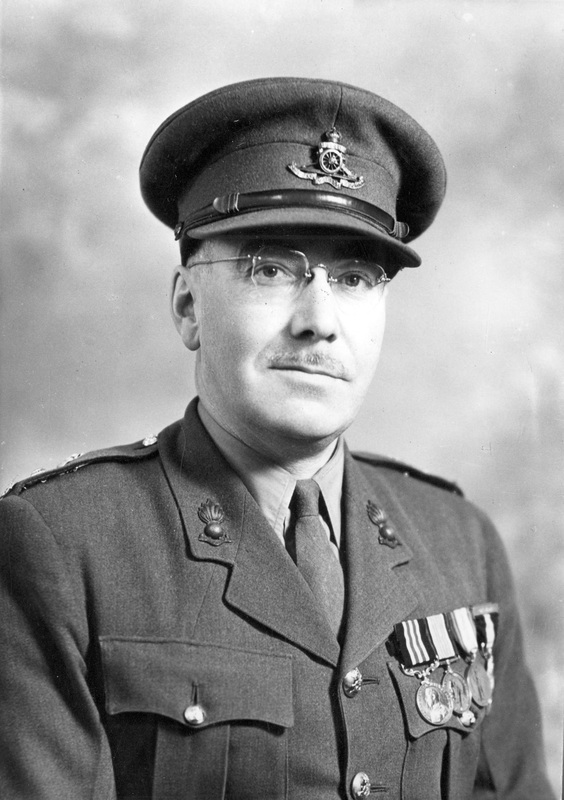 Coast Regt RCA at Prince Rupert on 27 Mar 1944, deceased in Vancouver on 16 March 1971. 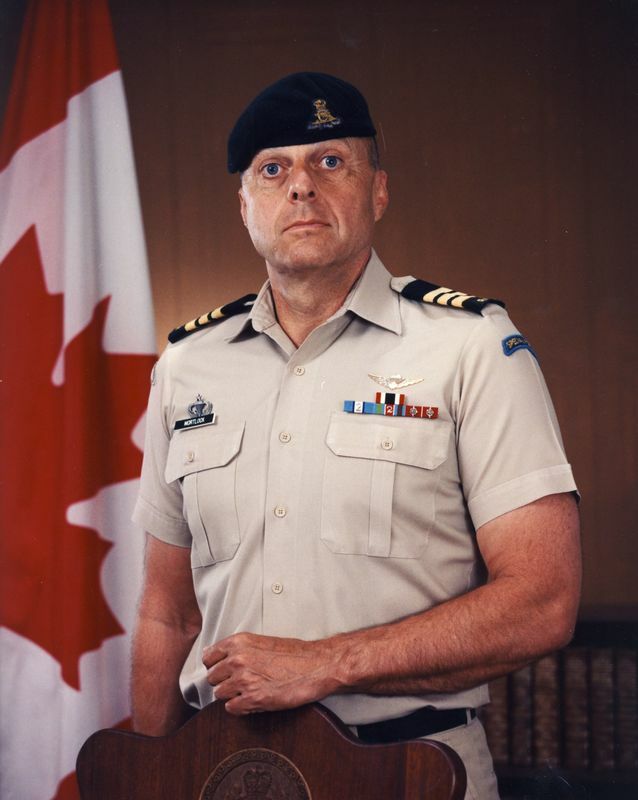 Major in 5th (B.C.) 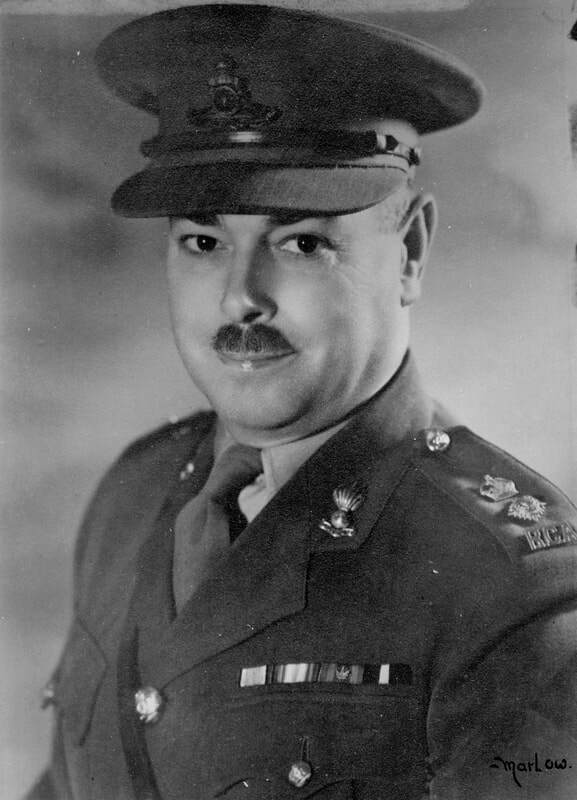 Coast Regiment RCA, Lieutenant-Colonel and Commanding Officer 15th (Vancouver) Coast Regiment RCA from 1942 to 1943, awarded Canadian Forces Decoration 15 Dec 1958, deceased 25 Mar 2004. 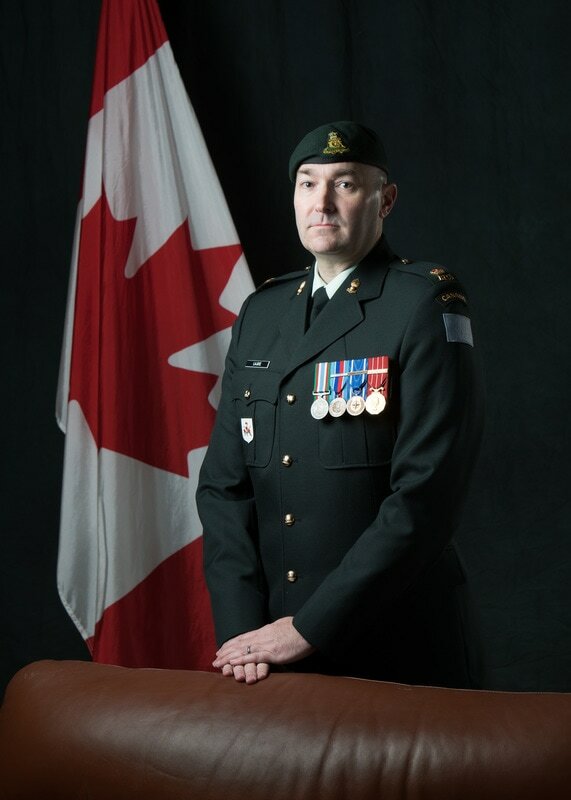 6th Field Company Canadian Engineers, Lieutenant May 1915, 1st Canadian Pioneers Sep 1915, England Nov 1915, France Mar 1916, wounded Armagh Wood Ypres 18 Jun 1916, England Jun 1916, Canadian Garrison Artillery Oct 1916, attached 245th Siege Battery Royal Garrison Artillery, Captain Nov 1916, France Jan 1917, gassed Messines 8 Jun 1917, 1st Canadian Heavy Battery, Lieutenant Mar 1918, 2nd Canadian Heavy Battery, Captain Mar 1919, Mentioned in Despatches 7 Mar 1919, Canada and discharged May 1919, Major in 5th Siege Battery 15th Brigade Canadian Field Artillery 1922, Corps Reserve from 1924 to 1925, 5th Reserve Medium Battery from 1925 to 1927, Lieutenant-Colonel and Commanding Officer of 15th (Vancouver) Coast Brigade RCA NPAM from 1940, 39th Reserve Field Regiment RCA from 1943 , 11th Reserve Anti-Aircraft Regiment RCA from 1944 to 1946, deceased 22 May 1982. 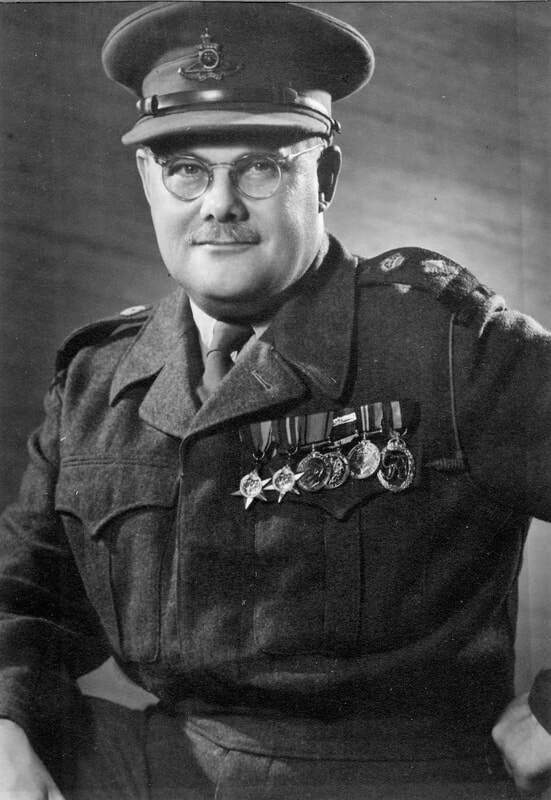 Corporal in 4th Trench Mortar Battery Canadian Field Artillery Canadian Expeditionary Force, awarded Military Medal in 1918, Major in 68th Battery 15th Field Brigade Canadian Artillery in 1934, promoted Lieutenant-Colonel and stood up the 1st Anti-Aircraft Regiment Royal Canadian Artillery on 15 May 1939, stood up the 6th Field Regiment Royal Canadian Artillery in the summer of 1941, appointed acting Commander Royal Artillery 3rd Division in 1942, promoted Brigadier and appointed Commander Royal Artillery 2nd Canadian Division later in 1942, deceased 1951, buried in Brookwood Military Cemetery Woking Surrey England. Taken on strength 21st Battery Canadian Field Artillery, attested into Canadian Over-seas Expedition Force 27 Sep 1915, arrived in England 27 Dec 1915,appointed Corporal 4 Feb 1916, taken on strength Reserve Brigade 15 Mar 1916, to be Acting Sergeant 10 Jun 1916, embarked for France 25 Jun 1916, taken on strength 1st Divisional Artillery Column 26 Jun 1916, attached 1st Brigade 2 Oct 1916, ceases to be attached 31 Dec 1916, reverts to ranks at own request 17 Jan 1917, gunshot wound left arm 26 Jul 1917, taken on strength 3rd Brigade 31 Oct 1917, wounded shell fragments 11 Nov 1917, struck off strength 3 Brigade Canadian Field Artillery 24 Nov 1917, to be Temporary Lieutenant 7 Sep 1918, taken on strength 16th Field Brigade Canadian Field Artillery 7 Sep 1918, proceeded overseas to North Russia 19 Sep 1918, disembarked Archangel Russia 1 Oct 1918, wounded but remaining on duty 27 Oct 1918, embarked for United Kingdom 11 Jun 1919, disembarked at Leith 18 Jun 1919, sailed for Canada 5 Jul 1919, struck off strength Canadian Expeditionary Force 21 Jul 1919, Lieutenant in 15th Brigade Canadian Field Artillery Corps Reserve from 1923 to 1925, transferred 31st Field Battery from 1926 to 1928, Corps Reserve in 1930, Lieutenant Colonel and Commanding Officer 15th (Vancouver) Coast Brigade RCA from 1938 to 1940, deceased 30 May 1976, buried at Westbank Cemetery. Taken on strength Victoria Fusiliers, taken on strength Royal Canadian Naval Volunteer Reserves, attained rank of Able Seaman, attested Canadian Overseas Expeditionary Force 18 Mar 1915, arrived England 10 Jul 1915, 48th Battalion 6 Jan 1916, embarked for France 9 Mar 1916, granted commission as temporary Lieutenant in 4th East Anglian Brigade Royal Field Artillery 21 Apr 1916, to 3rd Reserve Brigade in Exeter 28 Apr 1916, appointed Second Lieutenant 21 Jul 1916, posted to 3/4th East Anglian Brigade Royal Field Artillery and No. 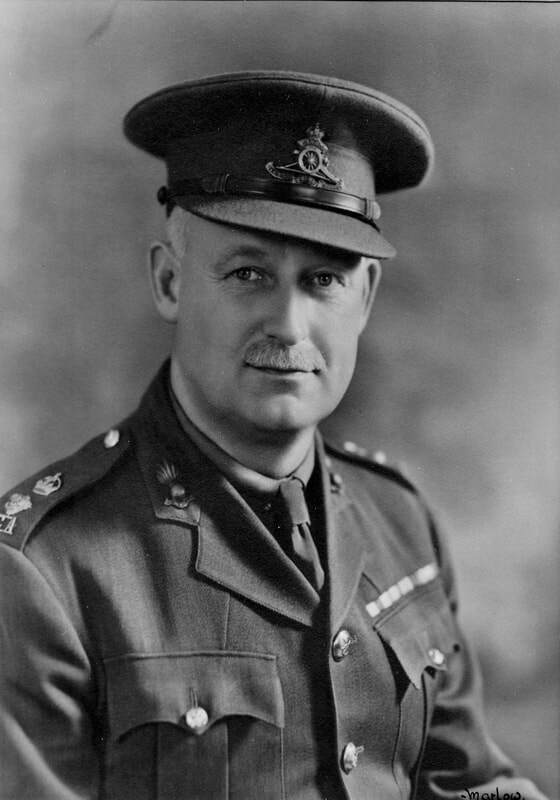 4 Artillery Training School, served in Egypt, served in the Balkans 1917, with 74th Yeomanry Division during the attack on Beersheba and the capture of Jerusalem, Captain in 31st Battery 15th Brigade Canadian Field Artillery from 1922 to 1925, promoted Major 1927, Battery Commander of 68th Field Battery 15th Field Brigade Canadian Artillery from 1927 to 1930, Member of Vancouver Armoury Association 1928, promoted Lieutenant-Colonel and appointed Commanding Officer from 1934 to 1938, Corps Reserve of Officers in 1939, appointed Commanding Officer 15th (Vancouver) Coast Brigade RCA NPAM 16 Jul 1940, appointed Acting Commander Vancouver Defences 26 Aug 1940, deceased 7 Sep 1981, buried Kelowna Memorial Park Cemetery. 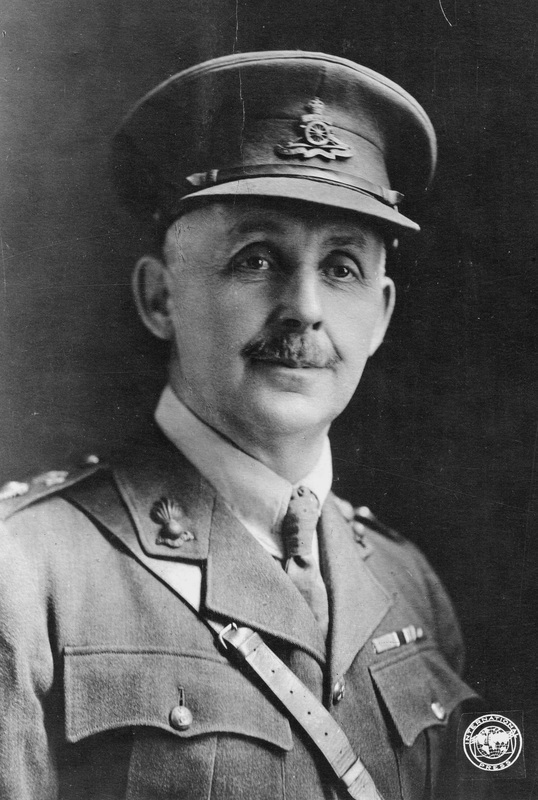 Member of Norfolk Imperial Yeomanry, attested into Canadian Over-Seas Expeditionary Force 1 Nov 1914, Lieutenant in No 19 Company Canadian Army Service Corps 10 Aug 1914, No. 8 Company 2nd Divisional Train 1 Nov 1914, proceeded to England 18 Apr 1915, proceeded to France 14 Sep 1915, invalided sick to England 10 Apr 1916, proceeded to France reinforcement in 131st Siege Battery 27 Nov 1916, invalided sick to England 12 Feb 1917, proceeded to France reinforcement in 6th Siege Battery Canadian Garrison Artillery 22 May 1917, proceeded to England on duty 17 Jun 1917, seconded to War Office (Aerodrome Construction) 2 Nov 1917, returned to Canada 5 Dec 1918, demobilized 15 Feb 1919, member of Vancouver Overseas Artillery Association in 1919, taken on strength with 68th Battery 15th Brigade Canadian Field Artillery on 15 July 1920, Captain from 1922 to 1924, Major from 1924 to 1928, Battery Commander 31st Battery from 1924 to 1928, member of Vancouver Artillery Association in 1928, Lieutenant-Colonel and Commanding Officer 15th Field Brigade Canadian Artillery from 1930 to 1934, architect for Bessborough Armoury, deceased 22 February 1967. Served with the 27th Battery Canadian Field Artillery in the First World War, Major in 31st Battery 15th Brigade Canadian Field Artillery in 1922, member of the Vancouver Overseas Artillery Association in 1919, Commanding Officer of the 15th Brigade Canadian Field Artillery from 1924 to 1930, founding member of the Vancouver Armoury Association 1928, organized the 18th Field Regiment RCA Jun 1941, took command of 2nd Medium Regiment later that year, took command of No. 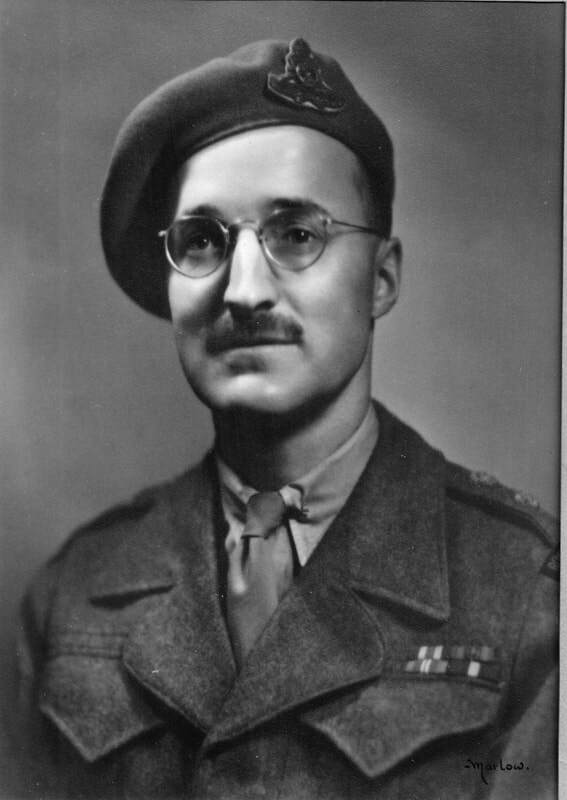 1 Canadian Artillery Reinforcement Unit in May 1943, appointed Officer of the Military Division of the Most Excellent Order of the British Empire 1 June 1945, engineer in charge of Mt Lolo project in 1956, deceased in 1973. Married Rose Hazelton 6 Jan 1899, taken on strength as a Lieutenant in 11th Battery 1st Brigade of the Non-Permanent Army Militia 1904, promoted Captain 1907, promoted Major 1910, promoted Lieutenant-Colonel Commanding Brigade 1915, organized 29th Battery Canadian Field Artillery 1915, took command of 11th Howitzer Brigade Canadian Field Artillery Canadian Expeditionary Force, embarked Canada 26 Feb 1916, disembarked England 13 Mar 1916, landed in France 15 Jul 1916, to be Acting Lieutenant-Colonel 27 Jan 1917, transferred to 10th Brigade Canadian Field Artillery on reorganization 25 Mar 1917, relinquished rank of Lieutenant-Colonel 26 Mar 1917, Mentioned in Despatches 9 Apr 1917, taken on strength 8th Brigade Canadian Field Artillery 6 May 1917, wounded Passchendaele 27 Nov 1917, Mentioned in Despatches 28 Dec 1917, awarded Distinguished Service Order 1 Jan 1918, posted 8th Army Brigade Canadian Field Artillery 30 Jan 1918, to be Acting Lieutenant Colonel 5 Mar 1918, posted 9th Brigade Canadian Field Artillery 13 Mar 1918, awarded Croix de Guerre (France) 11 Mar 1919, struck off strength to Canada 19 Mar 1919, taken on strength #2 D.D. 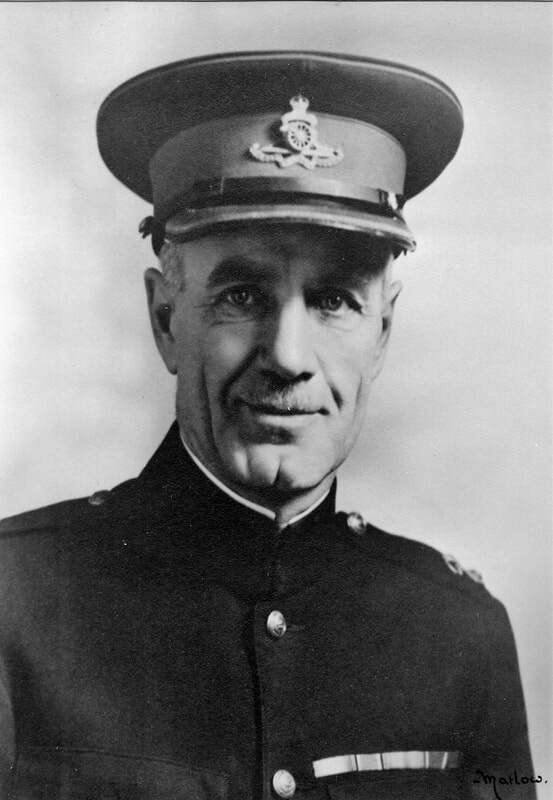 31 Mar 1919, struck off strength medically unfit 24 Apr 1919, Lieutenant-Colonel and Commanding Officer 15th Brigade Canadian Field Artillery from 1920 to 1924, deceased 9 Apr 1944.